It might have been a bit of a throwaway purchase when Rupert Murdoch’s News Corp bought Irish user-generated newswire Storyful back in 2013 for a pretty measly €18 million. But Storyful has been making quiet steps to capture the future of the Web – through the content you post and share from friends everyday – and you won’t even have noticed. Just today, a tool built by Storyful, Google’s human rights-focused incubator Jigsaw and the nonprofit Carter Center to analyze YouTube clips, has gone open-source so you can start working with others to tag and map user-generated video of news events. The Montage Web app and Chrome extension will be managed by Storyful and as per the company’s product offer, it “hopes the tool will surface a bounty of newsworthy videos that it can help uploaders license to news media,” according to a profile in Wired. Google already launched a YouTube Newswire ‘powered by Storyful’ back in 2015 to help it surface the best user-generated content for news organisations to buy. But as the volume of video coming out of news incidents often now adds up to more time than is played out during the live events, it’s clear something to analyze, tag, map and search was necessary. 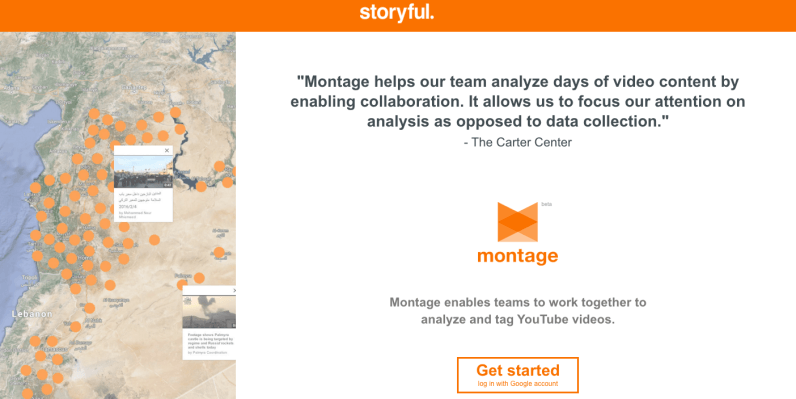 Storyful says of its new toy: “While we have a number of in-house tools that help us avoid replication of work, Montage streamlines our communication. Two weeks ago, Facebook too announced that it would be getting more serious about surfacing the best of user-generated politics content across its platforms, focused initially around the US election. It has also chosen Storyful, this time to source and verify, then help monetize your best poorly-focused Instagram videos. Indeed, Storyful’s former managing editor, Aine Kerr, announced in February that’d she’d actually be heading right over to head up Facebook’s journalism partnerships team. The company has just received a cash boost from its wealthy and rather prescient proprietor of just over €6 million. That’s likely in no small part due to the fact that its latest public set of accounts show that it made a €2.2m loss in 2014, on top of smaller but similar losses for the previous four years. It seems like Storyful is onto a good thing. User-generated content is nothing new, but someone’s got to see it, find it, sort it and split the proceeds. And it looks like this growing number of partnerships is Storyful’s best strategy for doing that. But like any publishing outfit in the modern digital wilderness, it’s still not clear how anyone is actually going to make any money out of it. If and when Storyful does, that’ll be going to boost the balance sheets of one of the most powerful media men in the world. Rupert Murdoch. Whose combined might, along with the new media powerhouses over Facebook and Google, leaves today’s publishing industry with an ownership that’s as concentrated as at any other time in history.